Ants invade your home through tiny cracks in search of food, leaving behind a long lasting and invisible scent trail for the rest of the colony to follow. Do-it-yourself sprays just kill the ants you see and if you don’t find the nest and eliminate the queen they’re soon back on the trail. Appearance: Reddish, about one-fourth inch long. Habits: Nest in mounds of one to two feet in diameter and about one and one-half feet high; large colonies can have up to 250,000 workers; very active and aggressive; will sting any intruding animal repeatedly. Diet: Omnivorous, known to eat meats, greasy and sweet materials. Reproduction: Total time from egg to adult averages 30 days; workers live up to 180 days; queens live two to six years. Other Information: Has been known to remove rubber insulation from telephone wires; sting is painful and can kill young wildlife. 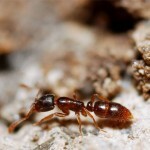 Habits: Nest in mounds of one to two feet in diameter and about one and one-half feet high; colonies can have up to 250,000 workers; very active and aggressive; will sting any intruding animal repeatedly. Appearance: From light to dark brown, about one-tenth inch long; antenna has 12 segments.